My first introduction to the Kate Somerville brand was through the ExfoliKate and I immediately fell in love. I then quickly added the True Lash & Goat Milk Moisturizer to my stash. When a gorgeous blue box landed on my doorstep filled with Kate Somerville favorites I was more than excited. True Lash: I was a tried and true Clarins Instant Eye Makeup Remover lover for the longest time until I tried a sample of the True Lash. True Lash is just as effective, but uses way less product. I also love that it is a cream based formula that quickly breaks down makeup, but doesn't have my tearing at my eyes. Along with it's gentle, yet effective removal properties it is also lash enhancing. It helps to promote growth and strengths them. Daily Deflector*: A super lightweight broad spectrum spf 50+. It contains mineral sun blocking ingredients, is super fluid, and blends seamlessly into the skin. It's the perfect base to keep skin youthful and protected without breaking you out. Nourish HydraGel Mask*: I have been using this one a ton lately. It's quick, deeply hydrating, and perfectly preps the skin for makeup. Whenever my skin is feeling a bit dull I'll put a quick layer on, sit for five minutes, and then wash it off. I find that after using it my skin feels plumper, softer, and glowy. It's also packed with nutrients that help with fine lines. It has a really nice clean, refreshing scent as well. Goat Milk Moisturizer: Packed with nutrients, this is my morning and evening moisturizer. It rejuvenates and balances my skin, leaving it highly hydrated without an oily residue. The goat milk has proteins, vitamins, and amino acids. Nourish Hydrating Firming Mist*: I also use this morning and night - after cleansing and before any serum or moisturizer. It's refreshing, nourishing, and alcohol free. It leaves my skin dewy and hydrated. ExfoliKate Intensive Exfoliating Treatment*: This is my favorite product to pull out when my skin is going through a rough patch. The exfoliation is intense - so I don't do it a ton - but I absolutely love the results. I massage on a tiny amount, really work it in, and then let it sit for a minute. Since it is both a physical and enzymatical exfoliation it delivers dramatic response. HydraKate Lifting Serum*: I use this mainly at night, after the Firming Mist and before my moisturizer. It helps to lock in moisture, improves texture/tone, and also firms the skin. 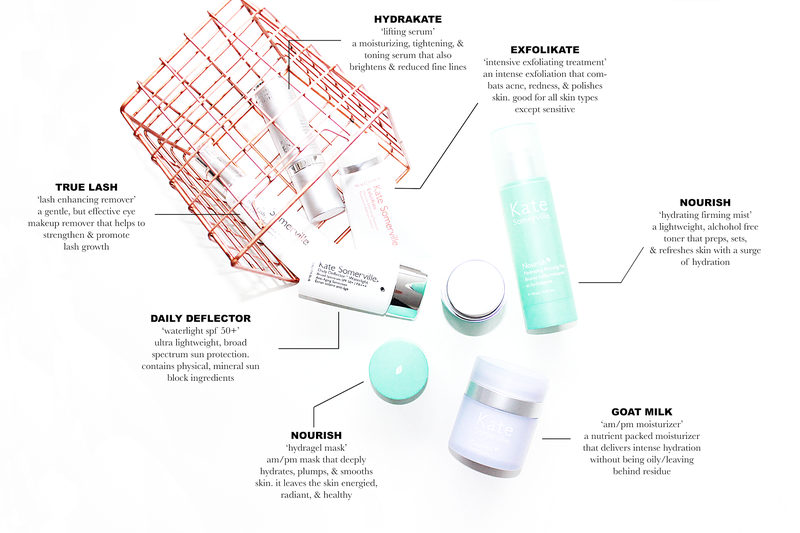 Have you tried any of Kate Somerville's products? If so, which are your favorites and if you haven't what skincare are you loving at the moment?